The reason for the season is cheese. Grilled cheese. Chrissy Camba never ate grilled cheese as a child. And yet “for some reason,” the chef at the new Bar Pastoral says, “I have good memories of grilled cheese.” Are Camba’s childhood memories rooted in commercials for Kraft American Singles rather than actual sandwiches? Maybe. But she can’t be blamed—to live in this country is to crave melted cheese between toasted white bread, whether you ate it as a kid or not. 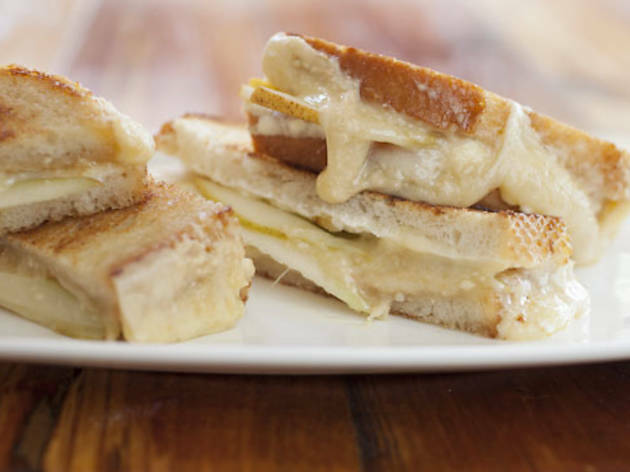 And that collective craving may explain Chicago’s current grilled-cheese obsession. After all, Mike Delgado never had it growing up, either (his family stuck to quesadillas). But now, he’s joined the ranks of Lakeview’s Cheesie’s and opened the Big Cheese, a restaurant that serves ten types of the sandwich. (“Man, grilled-cheese sandwich—once you [say] that, it makes people comfortable,” he reports.) William Von Hartz also found his grilled-cheese calling later in life, via a recipe from America’s Test Kitchen. He experimented at home for years, and now his cheddar-Gouda version is the best-seller at his eatery, Flipside Café. 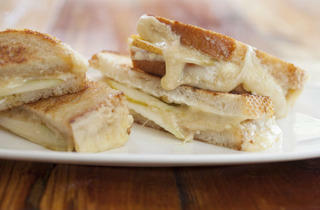 As for Camba, her grilled cheese (pictured) layers Saxony, ricotta, sliced pear and a housemade honey-almond butter. “I saw four-cheese, six-cheese, eight-cheese grilled cheeses, and I was just like, I want to keep [mine] to at the most two,” Camba says, proving one need not be an early adopter of grilled cheese to become an expert.